I stop going to hair salon for a hair cut since Rauhah was born. I do it on my own, just a straight cut whenever the long hair bothers me. So I did it again few days back at night. I tought Rauhah already realize but I was wrong. It happened she only notice the difference the next day on the afternoon. She said 'Wah..Ibu dah hair cut?!' while her eyes beaming. I thought my haircut was so neat that I finally can be a hairdresser. ... macam Dora!' with so much happiness on her face. 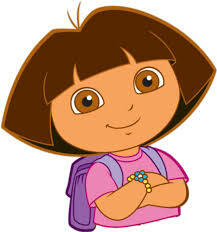 Haha.. so much of perasan lah myself boleh jd hairdresser takat gunting mcm Dora.